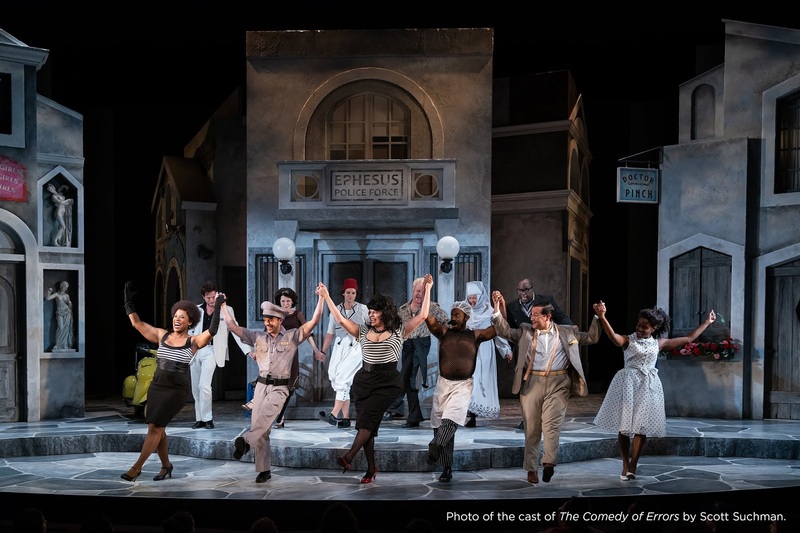 Smash cut to October 2018 and Alan Paul's production of Shakespeare's The Comedy of Errors for the Shakespeare Theatre Company, and the show begins with a rousing song and dance number composed by Michael Dansicker and choreographed by Karma Camp. Have my dreams been realized? And, more to the point, is that a good thing? 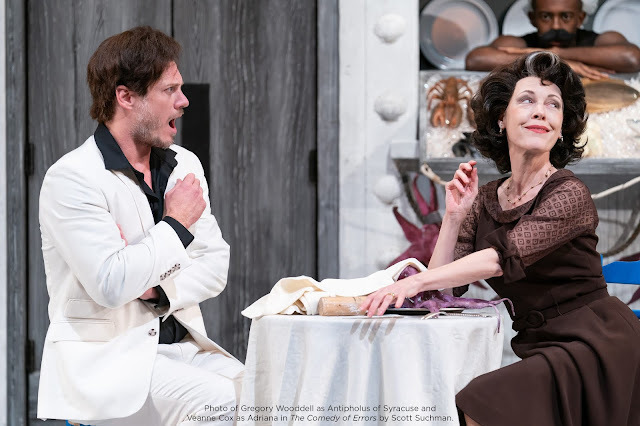 Paul's production is heaps of fun, a romp that transports Shakespeare (by way of Plautus) right into the logic and rules of a Bugs Bunny cartoon. There are comedy parrots, songs and dance, slamming doors, and pantomime dame-level drag characters. It's also a production trying to straddle two different approaches to the material- one transformative (let's make it a musical!) and one that just wants to let really, really talented actors have a go at the material. And by heaven, what a cast. Shakespeare wrote for a company of actors whose strengths he knew inside and out, and Paul is able to cast a slew of veteran STC actors (along with a few notable newcomers) and let them do what they are so very good at- Veanne Cox is a dream, Gregory Wooddell has never met a comic hero he can't sink his teeth into, Nancy Robinette and Ted van Griethuysen can instantly embue two characters we see for a combined ten minutes with depth, nuance, and humanity. Carson Elrod and Carter Gill make great work of the two Dromios, and Sarah Marshall is an unforgettable Dr. Pinch. As a trio that plays a bevy of background characters, the aptly named Proteans are played by Matt Bauman, John Cardenas, and Justin G. Nelson, and their sudden unexpected turn in the spotlight was a huge crowdpleaser. Does The Comedy of Errors need to be a musical? Most of the biggest hits of commercial theatre in recent years have been musical adaptations of films, with varying degrees of success. Most of the time, the underlying question behind those productions seems to have been "Can it be a musical?" rather than "Does it need to be a musical?" Likewise, does Comedy need to be a musical? Technically, it's already been done--Rodgers and Hart gave us The Boys from Syracuse back in 1938. If comparisons feel somewhat unfair, I'd argue that they're also inevitable. Obviously, Comedy doesn't need to be a musical, for which we have no less an authority than the author himself, who could certainly be considered somewhat of an expert in the theatre. When I see productions of Shakespeare that exist with a compulsion to be something other than the text itself, I always wonder what might have been if the director had chosen to let the play be the play. There are so many excellent qualities of this production that I think it would have been a damn fine Comedy of Errors sans the extra trappings. But what we have is something different, The Comedy of Errors--and Friends!. At the end of the day, the final question is, did the director succeed at delivering the production that they wanted? I don't have a window into Paul's mind, but I'm reasonably sure that the answer is Yes, and taken as it stands, it's a night of theatre with a good number of laughs in a time when most friends I know in DC could use just that.